Wales skills coach Neil Jenkins has dismissed claims from Toulon owner Mourad Boudjellal that Leigh Halfpenny could jeopardise his club career if he plays for Wales in New Zealand in 2016. Boudjellal reportedly said Halfpenny would need to "look for another club" if he goes on Wales' tour instead of playing for Toulon in the Top 14. 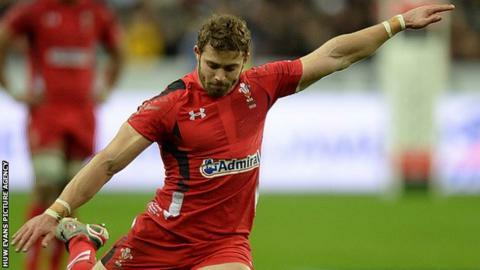 But Jenkins is confident full-back Halfpenny, 26, will be available. "If he's fit and ready, he'll be playing for Wales," said Jenkins. "There's no greater honour than playing for your country." With the French Top 14 taking a break next season during the pool phase of the World Cup, the season-ending play-off final will not be played until 24 June, 2016. Wales play their three Tests on tour in New Zealand on 11, 18 and 25 June. Toulon are aiming to regain their league title, and the triple European champions could be affected by the summer 2016 itineraries of South Africa and Australia as well. The likes of Bryan Habana, Duane Vermeulen, Matt Giteau and Drew Mitchell could be missing from their expensively-assembled squad. Toulon owner Boudjellal was quoted as saying: "Those players who won't be here for the end of the season, we would ask them to look for another club. "I hope that the international players choose to stay in France." Halfpenny, who joined Toulon from Cardiff Blues in 2014, is currently with the Wales squad as they prepare for the World Cup. Asked about Boudjellal's comments, Jenkins did not think they would have an impact on the British and Irish Lions player's international career. "That's up to them [Toulon] to discuss - I'm not involved in those kind of discussions," he added. "But I'm sure if Leigh is available, he will be touring with Wales. I have no doubt about that. "No matter where these guys are playing in the world, there's one thing that's always at the forefront of their minds and that's playing for Wales."